Felicitas Hoppe is a German writer. Her work often deals with transitory themes, as in ”Picknick der Friseure”, in a comical, but nevertheless thrilling way, which make her stories seem to be absurd. 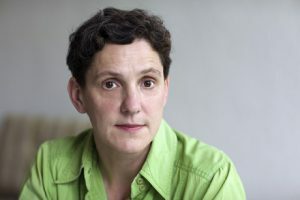 She also uses the technique of quotation for her novels, as in ”Johanna”, where she reconstructs the story of Joan of Arc using official case records. As a relatively young, successful and female writer, she belongs to a group of writers which literary criticism calls the ”Fräuleinwunder”.